Rahman’s stories, all 12 of them, have backdrops as varied as the lingering smell of dried fish curry accompanied with the thud of a wooden spoon against a clay pot in Modhupur in the 1930s’ east India, to the sudden blast of hot air that fogs one’s glasses when you enter a laundromat from the winter chill of Providence in Rhode Island. In between, there are stories set in the years of insurrection and war in Bangladesh. In Kerosene, a striking tale that opens with a violent paragraph, a revolutionary is in conflict with the sudden upheaval of war and circumstances that lead him to commit a heinous act. Now, finally, it seems as though a new generation of Bangladeshi writers is beginning to emerge, and Mahmud Rahman’s debut collection of short stories, Killing the Water (Penguin India), strongly suggests that he is a talent worth keeping an eye on. The voice that emerges from this collection is a quiet yet arresting and thought-provoking one. Rahman’s writing style is spare and elegant, and his calm, understated approach fits well with his poignant, bittersweet stories that will stay with you a long time after you finish reading them. The imagery most of Rahman’s stories evoke is that of movement. Movement, which, in almost every case, is irreversible but necessary, when meanings are lost as people are forced to leave, or when there is a search for a chance to make a new life in a new land. Then there are also the unaccountable, strange ways in which movement changes people. The stories appear in a linear, chronological fashion. The first few evoke a certain period in Bangladesh while those that follow are set in the US and are stories about migrants. These short stories are about people, not politics. 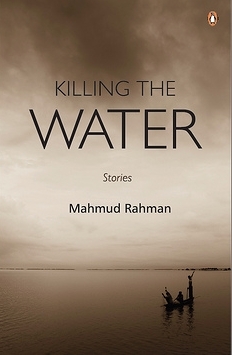 In Killing the Water, Rahman displays a deep empathy and understanding of people – whether they are speaking from Bangladesh or America is secondary. The Grand Narratives of ’71, the widespread malignancies of a country experiencing convulsive growing pains, or even the immigrant blues are not fore-grounded but largely the personal baggage of its characters. When the unnamed narrator of the rather-poignant story ‘Interrogation’ says, ‘I have no stomach for ideology. My conversations with them are brief. I try to coax them into talking about real experiences’, he might be articulating the topic tying this collection of short stories together. This is why he is successful in weaving all those experiences together in the beautiful and illuminating set of stories for his debut collection. The best story is “Kerosene”. Set against the backdrop of the 1971 war and told from a Bangladeshi nationalist’s point of view, it exposes the chilling horrors of war and shows how even a non-violent and mild-mannered society can lose its sanity during great socio-political upheaval. I found your book “Killing the water” in India and I immediately bought it as I wanted to read some writing from Bangladesh. I have found your stories very meaninful and I enjoyed your book a lot. I would like to read more Bangladeshi writers but unfortunately I do not speak bengali so I hope some translations will come! I have enjoyed reading your book. Your friend Kumar Murshid could do with reading your book.Looking forward to your next book. Bhalo theko. I seem to be having trouble getting hold of a copy of your book. It’s not available on the Penguin India website.